From the all-new world famous Nürburgring Nordschleife and Sebring tracks to the spectator-lined streets of New York City in the New York Circuit, race on meticulously designed tracks with an incredible sense of speed and realism. Forza Motorsport 2 features over 60 tracks carved out of 18 environments, including 13 real-world licensed circuits such as Road , Silverstone, Tsukuba, and Laguna Seca. Four new real-world licensed circuits further expand the world of Forza Motorsport 2. Collect, upgrade, and tune hundreds of cars. From sport compacts to purpose-built race cars, collect more than 300 cars from over 50 of the world’s leading manufacturers including Ferrari, Porsche, Nissan, VW, GM, and Lamborghini. Take your car to the garage and install alternative engines, suspension kits, bolt-on superchargers, brakes, rims, racing slicks, and more. Dial in advanced suspension settings, tire pressure, and gear ratios. Forza Motorsport 2 allows you to own the cars that will own the competition. Create and share your masterpiece with the world. Express your inner artist in the paint and upgrade shops with near endless visual personalization. Customize the shape of your car by combining different licensed rims, performance parts, and aftermarket body kits. Create your own unique paint scheme using millions of paint and decal options. Take in-game pictures of your creation in the Forza Motorsport 2 photo mode. 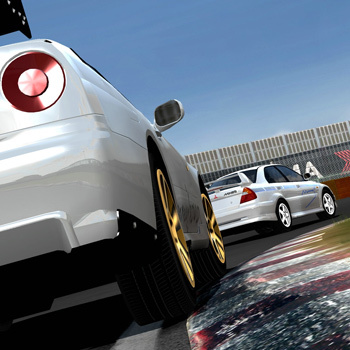 Take your personalized car onto Xbox Live for some intense online wheel-to-wheel racing. Earn in-game credits and even complete single player career objectives while racing over Xbox Live. Watch the best racers from around the world complete on Forza Motorsport 2 TV.